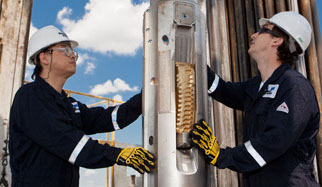 Baker Hughes, a GE company has posted Weekly Rig Count reports. Baker Hughes Rig Count: US +8 to 915 rigs. US Rig Count is up 8 rigs from last week to 915, with oil rigs unchanged at 738, gas rigs up 8 to 169, and miscellaneous rigs unchanged. US Rig Count is up 327 rigs from last year’s count of 588, with oil rigs up 267, gas rigs up 61, and miscellaneous rigs down 1 to 1. The US Offshore Rig Count is up 3 rigs from last week to 21 and down 2 rigs year-over-year. Canada Rig Count is up 5 rigs from last week to 208, with oil rigs up 1 to 109 and gas rigs up 4 to 99. Canada Rig Count is up 24 rigs from last year’s count of 184, with oil rigs up 9 and gas rigs up 15. Due to the Thanksgiving holiday schedule, the next North American rig count will be published on November 22, 2017 at 1 p.m. ET.